If you ordered at least 60+ items your delivery will be scheduled. For orders less than 60 items, you will need to pick up your order at one of our three Distribution Centers. REMIND EVERYONE Send home Pick-Up Reminders. PRINT WALL TAGS Pre-hung wall tags will help speed up the delivery process. Wall tags with your sale details will be available in “REPORTS” of the Sponsor section at joecorbi.com/welcomepbu. Log into our online computer system with your login and password provided by your representative. There are also generic wall tags on our website in the “How To” section. Print them out ahead of time so you can have them ready to hang on delivery day. SUPPLIES NEEDED Have scissors or box cutter and a marker handy—You will want to have a box cutter or scissors to aid you in opening up the taped boxes of food. A marker will also be good to have on hand in case there are any large orders that you want to box up and mark with the last name. You should not box any orders until after all of the orders have been pulled and double checked. If an item is missing, it is easier to check the orders that have been pulled when they are not in a box. SET UP A DESIGNATED AREA FOR YOUR SALE Use available tables, etc. to control the work flow of your helpers and the Seller/Parent pickups. It’s best to maintain control of the area to prevent any issues with missing or damaged products. HANG WALL TAGS Use tables and the walls to designate where you want the different items to be placed for easy sorting and pick up. Hang your printed wall tags where each item should be placed. The driver will place the items in those pre-determined areas when he arrives. HAVE PAYMENT READY Your Driver will ask you for payment before he unloads the truck. Make sure you have it ready. DRIVER ARRIVAL If your driver is over 15 minutes early, he will wait until you are ready to take the delivery. The driver can arrive 15 minutes before the delivery time or 15 minutes after delivery and not be considered late. If the driver is delayed he will inform our transportation department and they will contact you with an update. If you have enough Volunteers, assign some “helpers” to assist the driver with unloading the truck and placing the cartons in the correct spaces. NOTE: Make sure you provide your Rep with your correct telephone number on the delivery day. PAYMENT You will pay the driver with a School Check, Cashier’s Check or Money Order made out to “Fundraising Manager” before the food is unloaded. Your Driver can only make the delivery if he takes your payment with him. • The Driver will bring a copy of your invoice and two copies of the Delivery Report that lists everything on your order. Make sure you both have a copy. • Review the order together. This document lists everything on your bill. 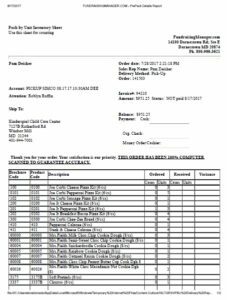 Check to make sure everything has been delivered according to this document. • SIGN both copies of the form. Driver will take one signed copy of Delivery Report along with your payment. Make sure the Driver takes your payment with his copy of the signed form. NOTE: Do not open taped cartons until the food has been inventoried with the driver—The driver will unload the boxes and put them in order. To help speed up the delivery process, volunteers can help the driver with unloading the boxes. Any box that is taped shut is a full case of whatever item is listed on the label. EMPTY ALL BOXES THAT ARE NOT TAPED SHUT OR HAVE A STICKER ON THE BOX STATING IT’S A MIXED ITEM BOX. These are partial cases and any number of items can be in these boxes. Do not let the volunteers begin opening the taped boxes or pulling orders until the inventory has been completed. Once inventory is complete, you can have a volunteer open all of the boxes and take the items out of the box. This will help make it easier to pull the orders if you can just grab an item as opposed to getting the item out of the case box. • Use your reports or Seller Orders/Envelopes to pick the orders for each Seller. You can also print pick sheets from the E-tally tool. • If you have enough Volunteers; assign two people to check to make sure each Seller’s order was picked correctly. • Make sure to review each Seller’s order with them to make sure their individual orders are correct before they leave. This is also the best time to collect/refund any money discrepancies you originally noted in your first order review. • Once the individual Seller confirms their order, have them sign your Seller Detail report for your records. The seller will then use the order sheet they kept to distribute the orders to their customers.